A single-engine Piper PA18 banner-towing plane has crashed into the beach in Carlsbad, officials said. The incident happened around 3 p.m. Saturday afternoon on the 4600 block of Carlsbad Boulevard near Cannon Road when the plane experienced a loss of engine power, FAA Pacific Division Public Affairs Manager Ian Gregor and CHP officials said. The plane flipped over and was partially submerged, Gregor said. The 23-year-old pilot, the only person on board, was not injured. A 12-year-old boy was clipped by the plane or nearby debris, officials said, and was taken to Rady Children's Hospital. The plane crashed near the warm water jetty, close to a power plant. 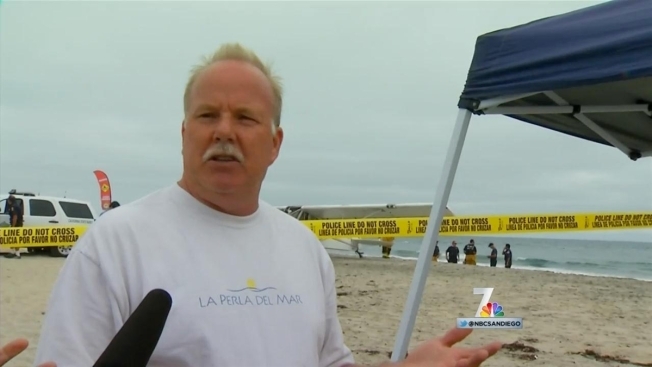 Beachgoers screamed and ran as a small plane came falling from the sky. NBC 7 has team coverage of the crash with NBC 7's Omari Fleming and NBC 7's Liberty Zabala. The plane is registered to Air Ads Inc., based out of Gillespie Field in El Cajon. The owner of the plane told NBC7 the pilot had 700 hours of training and the plane had just been serviced and checked out okay. "This airplane, I inspected no more than last week," said Jim Oakley, the plane's owner. "Changed the oil. Everything was perfect, flew yesterday, everything was fine." Eyewitness accounts from scene say a person was struck by the plane but officials cannot confirm any injuries or if anyone has been transported yet. Witness Cory Vaughn said she first saw the plane’s banner drop about 50 feet from the air before it made a 180 degree turn and crash-landed on the beach.